Patriots 2019 Free agent tracker. Rob Rang’s Draft Prospect Profiles: Safety - Special Teams. Don Banks analyzes 7 teams that face the most urgency in the 2019 NFL draft, Patriots included. Patriots Marathon Team raises $205,000 and counting. Mike Reiss shares some quick-hit weekend thoughts: Stephen Gostkowski: ‘I was 100 per cent wanting to be here’; TB12’s challenge for 2019; Opening night opponent options; More. Ryan Hannable’s Sunday 7: Patriots likely will break trend of not drafting wide receiver high in NFL draft; More. Tom E. Curran’s Sunday Notes: Deebo Samuel’s judgment was debatable in goodbye to ‘Billy’ Belichick; Ready for a streamlined Dont’a Hightower? ; More. Steve Balestrieri (PatsFans) Sunday Patriots news, AFC East notes: Tom Brady beginning offseason workout at his home; Seferian-Jenkins is excited to play in New England; More. Doug Kyed examines the likelihood the Patriots could trade up in the first round with the Seahawks, who have only four total picks in this year’s draft. David Latham (LastWordOnSports) A breakdown of recent Patriots first round picks. Doug Kyed picks a quarterback for the Patriots in each round of the draft. Kevin Duffy previews the running back position for the Patriots in the draft: It’s not a high priority, but running back could be on the Patriots’ to-do list. Kevin Duffy makes the case that there are no guarantees for the Patriots (or any teams) when drafting wide receivers. Evan Lazar posts his Patriots Top 50 Big Board: 41-50. Matt Vautour profiles Springfield DL Christian Wilkins. Ryan Hannable passes along the report that the Patriots have extended Patrick Chung through the 2021 season. David Latham (LastWordOnSports) Patriots 2019 NFL draft targets: Iowa State WR Hakeem Butler. Alex Reimer notes that Tom Brady will be forced to wear a new helmet next season, and he doesn’t seem thrilled about it. Michael Hurley tells us Tom Brady’s record last year wearing his old helmet, vs. wearing a newer model. Dakota Randall notes Julian Edelman took to Instagram ahead of the Celtics’ Sunday Game 1 to show love for Kyrie Irving, Jayson Tatum and Co.
Nick Goss reports Robert Kraft and Sony Michel were spotted representing the Patriots at the Celtics-Pacers Game 1 on Sunday. NESN also posts Julian Edelman’s Instagram goodbye message to Chris Hogan. Chris Grenham relays a couple of videos showing Rob Gronkowski pumping up the TD Garden crowd before Game 2 of Bruins-Leafs Saturday night. Nicole Yang writes how Tedy Bruschi is running the 2019 Boston Marathon for a personal cause. Mark Daniels presents his newest Patriots 7-round mock draft. Pats pick Iowa TE Noah Fant at 32. 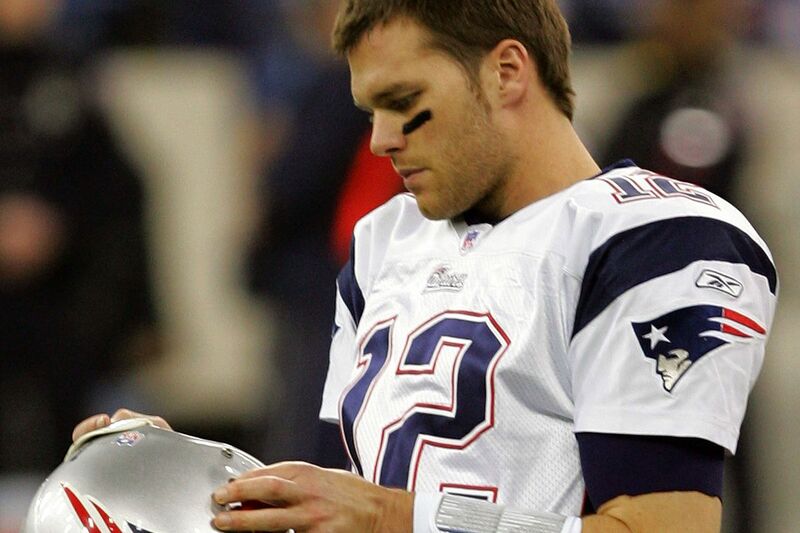 Kevin Seifert (ESPN) NFL enforces helmet ban for Brady, 31 others. Josh Alper (ProFootballTalk) Stephen Gostkowski: Taking my time made me sure I wanted to stay in New England. Matt Eppers (USA Today) Patriots owner Robert Kraft gets standing ovation at Celtics-Pacers game. Albert Breer (SI) Monday Morning QB: In Green Bay, the Matt LaFleur-Aaron Rodgers partnership begins. And watch that YouTube clip of “Every Team’s Offseason in a Movie.” Pretty good. Peter King (ProFootballTalk) FMIA: What if Arizona doesn’t draft Kyler Murray with the No. 1 pick? Jim Reineking (USA Today) 4th & Monday: These teams are most likely to shake up NFL draft day. Russell S. Baxter (FootballMaven) NFL 2019: Key comings and goings (As of April 14). /Patriots’ turnover will make this year interesting to say the least. Danny Heifetz (The Ringer) The four GMs who could wreak havoc on the NFL draft: Jon Gruden has three first-rounders and an itch to trade. Bill Belichick has 12 picks and could pick up more. What does this mean for the rest of the league? Andy Benoit and Gary Gramling (SI) 2019 NFL Draft: Biggest need, hidden need and top targets for all 32 teams. R.J. White (CBS Sports) Ranking the 10 trade scenarios that make the most sense in Round 1. 5th Patriots use draft wealth to move up. Caleb Friedman (SI) Under-the-radar late-round NFL draft prospects to watch. Chris Trapasso (CBS Sports) 2019 NFL Draft: Here are the 10 biggest sleepers who will prove to be awesome value picks. Michael David Smith (ProFootballTalk) Defensive linemen dominate the list of top available free agents. Terez Paylor (Yahoo! Sports) Bust-proof: Here are 8 of the safest prospects in the 2019 NFL draft. Pete Prisco (CBS Sports) 2019 NFL draft better-than team: 20 guys I like more than the scouts do. Mike Florio (ProFootballTalk) Should the NFL release the schedule after the draft? Tadd Haislop (Sporting News) NFL Draft 2019: Date, start time, order of picks, TV channels and live stream. Susan Glaser (The Plain Dealer) Pro Football Hall of Fame plans massive celebration for 2020 NFL centennial. Manish Mehta (NY Daily News) Sam Darnold isn’t ready to say Jets will wrestle AFC East crown away from Patriots. Mike Florio (ProFootballTalk) The time is now to tie future earnings to cap percentage. Ryan Hannable tells us what happened at Friday’s Robert Kraft hearing, including prosecution admitting no human trafficking occurred. Frank Schwab (Yahoo! Sports) Reuben Foster fined, not suspended, for incident that led to his release from 49ers. How the Patriots should approach their needs in the 2019 NFL Draft The Patriots have a couple glaring needs. Here’s how they should fix them.